Chiefs general manager Bret Veach said during a wide-ranging interview Thursday that some of the financial decisions made dating back to last offseason were done with Mahomes in mind, such as the way the franchise structured contracts and how they approached free agency and the draft. "We were prepared for Pat to have success and be a franchise quarterback," Veach said, "so this process of structuring ourselves for the next three, four, five years started about a year ago." In the ensuing 12 months, the Chiefs traded incumbent quarterback Alex Smith to Washington and handed the job to Mahomes, who threw for more than 5,000 yards along with 50 touchdown passes while leading the club to its third straight AFC West title and the conference championship game. The Chiefs lost in overtime to the Patriots, a defeat made even more frustrating by the fact that Kansas City lost the coin flip and Mahomes never had a chance with the ball in the extra session. Off the field, Mahomes has become one of the NFL's biggest stars. 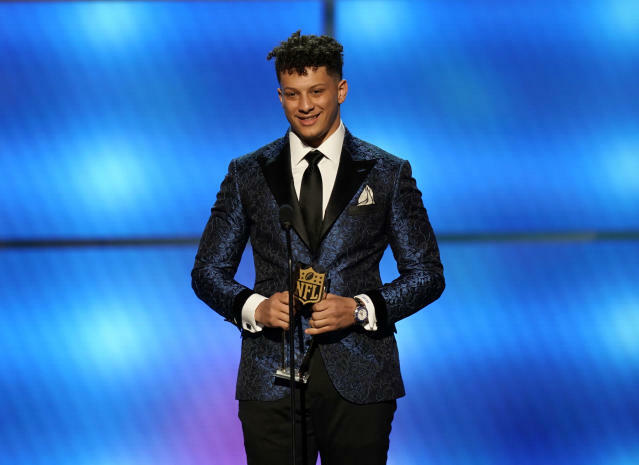 With his moppy Mohawk, earnest attitude and game-changing ability, Mahomes became must-watch TV by the end of the season. He had the eighth-best selling jersey in the NFL, has been courted by a wave of sponsors and has led Las Vegas odds-makers to peg the Chiefs as Super Bowl favorites next season. Some suggest Mahomes could ultimately sign the first $200 million contract in NFL history when he is eligible for an extension after next season. "Even last year, we were putting a plan together," Veach said. "I think we have a good plan, and everything we do structure-wise will allow for necessary room moving forward." Packers quarterback Aaron Rodgers set the market with a $134 million, four-year extension last offseason, while Falcons quarterback Matt Ryan signed a $150 million, five-year deal. Rodgers has the average highest salary while Ryan had the highest signing guarantee of $94.5 million. Whatever it takes, Veach is intent on making sure the Chiefs have flexibility to do it. "Obviously there's tremendous talent, and we had seen obviously a chance to see a lot of his work in college, and we saw all last year," Veach said. "You knew it was inevitable it was coming. But what surprised me was the ease at which he did it. Even great players when they're young, you anticipate a wall at some point after seven, eight weeks, but there was never really a time." 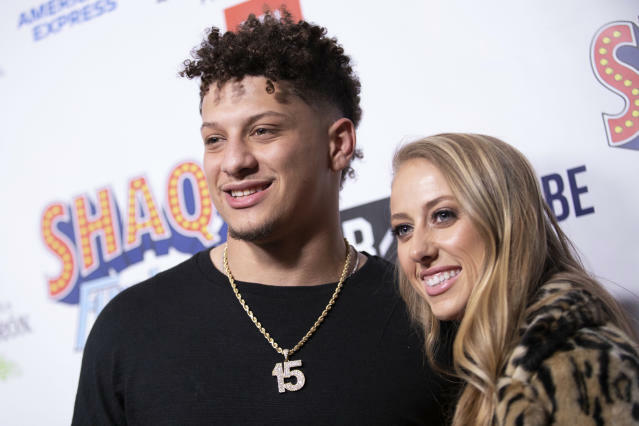 Video of Mahomes making a slick spin move during a pickup basketball game went viral this week, and Veach said he's already spoken to his quarterback about being careful off the field. "It was obviously a light-hearted discussion," he said. "The problem with Pat is he does everything 100 mph and so dang competitive. I was like, 'Hey man, you're breaking a lot of ankles out there. Don't break your own.' And he was like, 'No, no, we got that.'" Eric Berry hardly played last season because of a mysterious heel injury, though he was on the field for the AFC title game. Veach said the highly-paid safety would discuss with doctors and the training staff whether to have surgery this offseason. "There's so much medical information they are working through," he said. "They're going through all the postseason evals and exams and then sit down and put together a plan." The Chiefs are expected to switch from a 3-4 defense to a 4-3 under new coordinator Steve Spagnuolo, and that could cause big personnel decisions. Veteran linebacker Justin Houston has the Chiefs' biggest salary cap number at $21.1 million next season, while top pass rusher Dee Ford could be a candidate for the franchise tag as he hits free agency. "We are running a different scheme now and we started the process Monday of going through the roster, giving you a pure feel of strengths, weaknesses, where we can get better," Veach said. "Dee is a player that has done so much for us. We're excited about bringing him back." Defensive tackle Chris Jones and wide receiver Tyreek Hill are eligible for contract extensions this offseason, and Veach said those discussions could begin at the NFL combine. "We'll have a lot of dialogue with their agents," he said. "We want them to be here. I'm sure they want to be here and we want to keep this rolling." Veach danced around the question of whether the Chiefs would ever sign running back Kareem Hunt, whom they cut midway through the season after video surfaced of him kicking a woman in a Cleveland hotel. Hunt remains on the commissioner's exempt list, but other teams have expressed an interest in the former NFL rushing champion. "Our focus and our hopes with Kareem is he's able to take the steps necessary to get his life in order, and do the right things," Veach said. "Everything else after that is not as important."